Music figured prominently at Fairfield College Preparatory School's 71st commencement Sunday at Alumni Hall on the campus of Fairfield University. Almost every speaker sang a line from at least one song that reflected their experiences at the Jesuit school. Senior commencement speaker David Bruton of Trumbull recalled his first encounter with Fairfield Prep at the Wonderland of Ice in Bridgeport when he was a child. The Prep team had scored during a hockey game and fans broke into their confident goal song, "Don't you wish you went to Prep, doo-dah, doo-dah," Bruton sang, to the tune of "Camp Town Races." "From that day on, I honestly did," said Bruton, a member of the academic top 2 percent of the Class of 2013 and who was voted by his 200 classmates to deliver the address. The Rev. John J. Hanwell, S.J., president of Fairfield Prep, practically gave a solo concert singing bits of a half-dozen songs from Tony Bennett's "I Left My Heart in San Francisco" to the theme song from the television comedy "The Beverly Hillbillies" to the Drifters' classic, "Up on the Roof," to which the audience clapped along. "It was the year Beatlemania began," Hanwell said before belting out, "She loves you, yeah, yeah, yeah," as he took the school's Golden Class of 1963 on a trip down Memory Lane. Guest commencement speaker, the Rev. Martin Shaughnessy, S.J., who taught theology at Prep for 42 years (the Class of 2013 was the last to have him for Freshman Theology) didn't sing but he quoted from Simon and Garfunkel's "The Sound of Silence" -- "The words of the prophets are written on the subway walls and tenement halls." He called Martin Richardson, the 8-year-old boy killed in the Boston Marathon bombing in April a prophet and asked the graduates to go forth with Richardson's commitment. "Wherever you go make his words come true," Shaughnessy said, referring to a photograph of the child holding a poster that read: "No more hurting people. Peace." "Evil will never triumph over good ... Men like you can make a difference ... God is calling you. Each one of you has the talent and opportunity to do something good for God," he said. Shaughnessy also mentioned the athletic success of the Class of 2013, particularly the hockey team, which won the state championship in March. If Kyle Mollo, 18, of Fairfield, was a bit bleary-eyed as he crossed the stage to receive his diploma, few would blame him. He got only an hour or two of sleep the night before, not because he was doing some pre-commencement celebrating. Rather, he was celebrating the Fairfield Prep baseball team's win Saturday that put the school in the semi-finals for the first time in about 20 years. And he had something significant to do with it. Mollo pitched a complete, seven-inning shut-out game at Muzzy Field in Bristol. The team is scheduled to return there Tuesday for their contest against Amity Regional High School. "It's unreal. It's pretty cool. It's awesome. It's unbelievable," Mollo said. "What we did yesterday hasn't been done in so long. It's getting the whole school excited (but) the graduation is top," he said. Among all the hundreds of faces in the crowd, Thomas Cunningham, 18, of Fairfield, was surprised to see his own. As he crossed the stage to accept his diploma his mother Ellie Cunningham, grandmother Eleanor Agnello, and a handful of other relatives held up life-size cut-outs of Thomas' head. 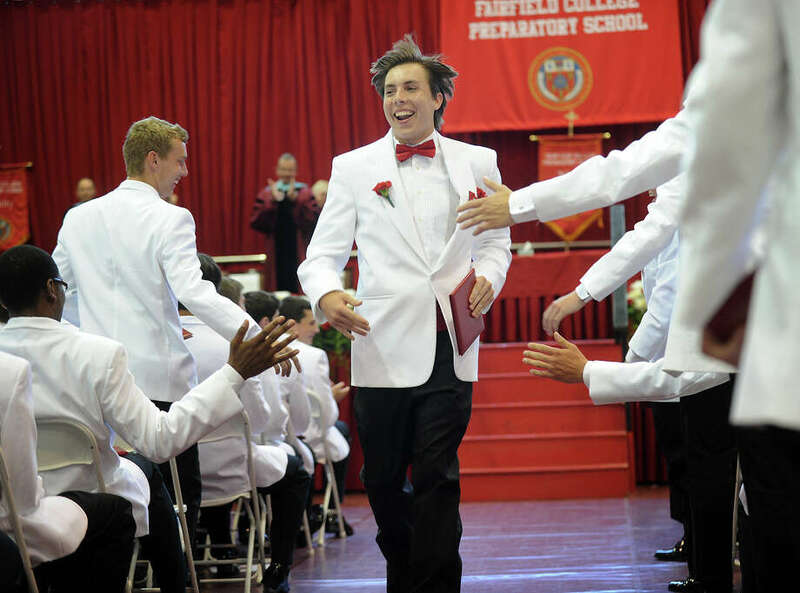 "I'm pretty excited, but sad that I'm leaving Prep because of the many friends that I made here and the brotherhood," Cunningham told the Fairfield Citizen. It was the brotherhood that brought about a dozen members of the Class of 1963 back for Sunday's graduation ceremony. "I came for my classmates and my school, and for these guys, the soon-to-be graduates," said Vincent O'Connor of Seattle, Wash., who, with his long white beard and red socks, could easily be mistaken for Santa Claus. "If they only knew what was ahead of them," said O'Connor, who carried a walking stick into which the words, "The joy is in the journey," were burned.